Walking with Jesus: Day 45: Acts 14:8-18 & Prov 17:1-9 - Can a Minister Get too Popular? Day 45: Acts 14:8-18 & Prov 17:1-9 - Can a Minister Get too Popular? Can a Minister Get too Popular? Yesterday, we looked at facing opposition in ministry and today's we're looking at too much popularity. Such is the unpredictable nature of life sometimes! Paul and Banabas had to leave Iconium to avoid being killed by fierce opposition. Today, we see them in danger from a crowd again, but this time, the crowd is literally trying to worship them as gods! 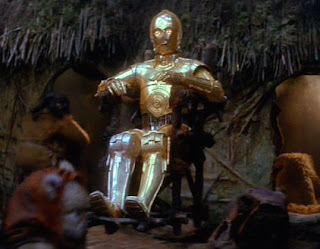 The scene reminds me of Return of the Jedi, when the Ewoks worshiped C-3PO as a god. So, can a minister get too popular? As the pastor of a small, young church, some days my response to that question is, "I don't know, but it would be fun to see what it's like." (Just being honest!) The truth is that popularity is a very real danger, and fame has at times caused more serious problems for ministers of the Gospel and the cause of the church than opposition has. Opposition will drive a minister to his knees, to examine his conscience, to depend even more on Christ. Popularity can give a minister an unhealthy sense of self-sufficiency and can lead him to arrogance, presumption and a dangerous neglect of his personal walk with the Lord. For those who are not in ministry, the same principles can still apply. God brings trials into our lives because He loves us and wants to keep us where we need to be, on our knees. Very often, success is a bigger temptation than failure and complacency is more dangerous than a constant sense of our inadequacy and our need for Christ. So, how did Paul and Barnabas handle their extreme popularity? They didn't act like C-3PO and just allow the people of Lystra to worship them. They strongly responded to the crowd's actions by pleading with them to repent: "When the apostles Barnabas and Paul heard of it, they tore their garments and rushed out into the crowd, crying out, 'Men, why are you doing these things? We also are men, of like nature with you, and we bring you good news, that you should turn from these vain things to a living God, who made the heaven and the earth and the sea and all that is in them.'" This is the right way to respond to popularity, to urge people to look to the Lord and not to ourselves. We should remind people that we just regular people, with a regular human nature like everyone else, and we should direct them to turn to the Lord. Inside, we need to believe our own words. We need to believe that we are weak and fallible and that we are no better or more special than anyone else. Our call to ministry - whatever the ministry or calling may be - is God's gift to us for His glory. We are not God's gift to anyone. Jesus is. We can all learn from yesterday's time in Iconium and today's time in Lystra: Life is full of ups and downs, successes and opposition, triumphs and trials. The only safe place to be in every season and turn of life is walking closely with Christ, depending on Him in everything! Heavenly Father, we thank You for Your love for us and for the gift of salvation. We thank You for calling us to serve You and work to advance the Gospel in this world. Thank You for calling us to ministry. Give us Your grace to empower us to faithfully serve You, to advance the Gospel, to glorify Christ. Keep us from arrogance and from the foolish illusion of self-sufficiency. In Jesus' name, Amen. that we may be a blessing to others and may honor You. for our only hope is always found in Christ. Father, turn our ears away from gossip and our tongues away from mischief. Give us hearts to care for the poor, to serve those in distress. and for the gift of being part of Your family. You are our Father and our glory! and keep us from false speech and self-serving words.